The darkness reminded him somehow of being an unborn child—as if one could remember such a thing—floating weightless, enveloped by warmth. What would anyone give to fall back into such a simple existence, removed of all need beyond instinctual thought? What a fortunate nine months it would be. A wonderful life, sleeping and cared for inside the womb, never requiring a voice. All before anyone could teach a soul to love or hate, or something or someone was unwanted. Is that what was happening here? Had he somehow regressed back before his own infancy? The pangs of jealousy he was experiencing told him no. Sadly, no. He felt like he’d been slumbering for such a long time, and very, very gradually he started to wake. Threads of logical coherence tickled his thoughts in the dark. It was not a welcome sensation, and he fought to avoid it. Why couldn’t he go back into the lovely silence? Envy for the ignorance of the unborn rolled through him. How unfair it was to have the innocence of being sequestered and never hearing the taunts of children or comprehending the cries of the intolerant taken away from him. If only he had never heard slurs of hatred or understood what defined a second-class citizen. What was that sound? Could it be a faint heartbeat in the distant void? It sounded brash and unnatural, refusing to lull him back to sleep like the soothing cadence of a mother’s pulse. Like a child, he wanted nothing more than to stay safe and warm, but like in every instance, someone always forced a person into the painful light and cold of reality. The darkness parted above him with a soft mechanical hiss. The warmth bled away, making him want to cry. Daring to open his foggy eyes, he squinted in the artificial light. A woman in a white coat hovered over him. “Good. Your stats are looking healthy.” A warm smile graced the young woman as she read over the flat scanner in her hand. Focusing was becoming easier. He found himself undressed, lying back in comfort, some kind of foam bedding molded around him. It held him effortlessly, but its touch was delicate, tricking his senses into thinking he was floating. Several small pieces of equipment were attached to his body, taunting him with their hidden binary code. She touched one piece of technology and looked back to the miniature screen she carried. “Are you a doctor?” Costa asked. Costa looked around and found himself inside an enormous medical bay filled with mechanical wombs, just like the one in which he lay. Men and women in lab coats drifted from capsule to capsule, setting free the dazed people inside. Some were more awake than others, with men, women, and children milling about the vast room as they dressed. The more he saw, the more the cloud over his thoughts lifted. “This is odd.” The doctor squinted at her handheld display. She might have been genuine and helpful, but she couldn’t go away fast enough for his tastes. Once she left, Costa took on the slow task of sitting upright and retrieved his clothing from the bin alongside the bed. After he was dressed and found his footing, Costa wandered over to the observation decks located next to the hypersleep room. He couldn’t bear to keep looking at the rows of chambers. Even with all the living people inside, each capsule reminded him too much of a coffin, and with so many clustered together, the errant idea morphed itself into some kind of perverse morgue. He couldn’t bear to spend time entertaining the image. It sparked far too many horrific memories. The view into space through the three-story-tall view ports lining the wall pushed back the recollections. Alpha Centauri Prime grew larger as they approached, looking similar to his homeworld with its land masses and blue waters, even if the continents didn’t match. He had to look more than once to convince himself the world before him was not actually Earth. Costa had no intention of ever setting foot on that planet again. 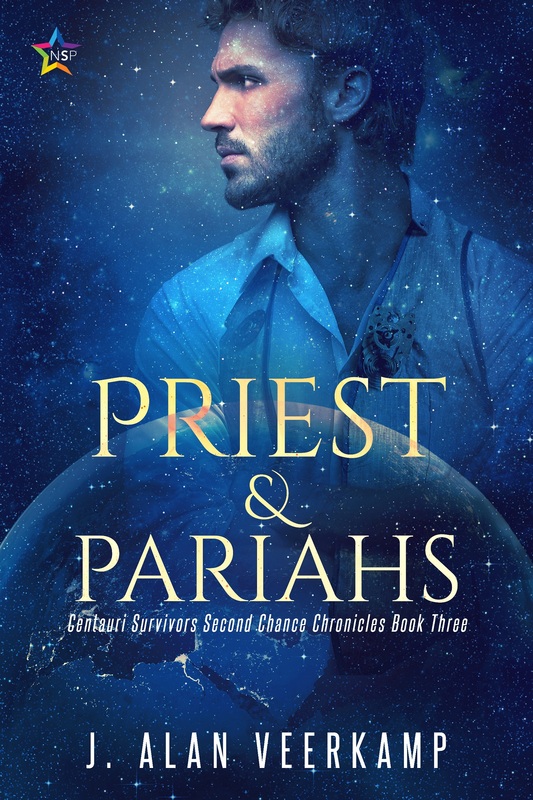 Tagged Centauri Survivors Second Chance Chronicles, Excerpt, Giveaway, IndiGo Marketing & Design, J. Alan Veerkamp, Priest & Pariahs, Promo, Rafflecopter, Release Blitz!